Pressure cook rajma and black gram till it becomes soft. Heat 4 tbsps oil. Add onions. Brown them. Add ginger-garlic paste and tomatoes. Fry. Add all the masalas, beans and salt.Simmer till well blended. The gravy should be thick. Pour over cream and ghee. Knead a soft dough with flour, ghee, curd, salt and just enough water. Roll into lemon-sized balls. Cover and keep for one hour. Then roast in batches on hot coals till puffed and golden outside and spongy inside. Keep hot. Garnish the daal with coriander leaves and slit green chillies. 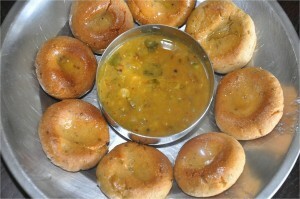 Dip hot (baati) dumplings in the daal while eating.